When did you first realize that the Fresh Prince could legitimately act? Like, in the big leagues? For once in my life, I was on the early part of the curve; my college newspaper assigned me, a green freshman, a review of Six Degrees of Separation, John Guare's adaptation of his own play about a fancy Upper West Side couple (Donald Sutherland and Stockard Channing) who are taken in by a gay con man who claims he's the son of Sidney Poitier. So I was blown away, even at 18, by how immediately and totally Smith owned the camera. Sutherland and Channing were both highly respected actors (Channing actually earned an Oscar nomination for the film), but Smith pushed them right off the screen, taking a character that could have been offensive and invested him with real heart and care. His Paul was charming, engaging, and vaguely sinister, but mostly earnest—the most sincere con man you'd find. Smith gave the role all he could; he was desperate to impress, and it made his character strangely moving. That's what struck me about Smith, both then and later, when he would become the biggest movie star in the world: He never half-assed it. He had a seriousness, an attitude of I really do want to be the best at this, that was obvious from that first big film and that he carried with him into Hollywood superstardom. From his first major breakthroughs in Bad Boys and (especially) Independence Day to his more Actorly roles in Ali and The Pursuit of Happyness to even his star projects like Hancock and I, Robot, Smith was like a politician who never stopped working for your vote. My favorite work of his is probably in I Am Legend, in which he imbues his last-man-on-earth scientist with legitimate sadness and even a considerable splash of madness. It was impressive to watch a massive movie star, headlining a tentpole action movie, willing to go all the way with his performance. The man never cheated you out of your dollar, and it was impossible not to respect that. He was the whole package, powerful actor and powerful movie star, and I couldn't wait to see what he'd do next. But what he did next was he turned tail and ran home. Smith made two movies in 2008, one of which was Hancock, which was fine if bloated and loud. The other was the one that should have worried us. It was called Seven Pounds, and it was the sort of film a big movie star makes when no one is around to tell him "no" anymore. It was a vanity, faux-"uplift" disaster, the story of a man who decides (spoilers, if you care; the movie has been out for four years) to give away all an assortment of his organs (the "seven pounds" of the title). It cast Smith—in a film he produced, shepherded into existence and reportedly rewrote himself—as a Christ figure, a martyr who is too beautiful and ethereal for this world. The movie is probably most famous for its ending, which features Smith committing suicide by sitting in a bathtub with a jellyfish, a schlock moment to end all schlock moments, which you can watch right here. (The notion of Smith, the actor, doing countless takes of his big death scene by flopping around in a bathtub is hilarious to even ponder.) The movie also earned a place in movie lore for A.O. Scott's deliriously funny review in The New York Times, in which he called it "among the most transcendently, eye-poppingly, call-your-friend-ranting-in-the-middle-of-the-night-just-to-go-over-it-one-more-time crazily awful motion pictures ever made." What was most worrisome about Seven Pounds, outside of its awfulness (and critics voted it the worst film of the year, no small feat, since The Happening and The Love Guru were in the running), was what it signaled about Smith: He was losing touch with his audience. He was starting to go down the Tom Cruise path, into the rarified air of the mega movie star, unable to see himself as anything other than special and sainted. It was a tragic misstep, one Smith has only made people forget about by vanishing from movie screens since. Seven Pounds was the last movie Smith appeared in, and it's difficult to blame him; I'd hide too. In the last four years, Smith spent his time tending, somewhat creepily, to the careers of his children, Jaden and Willow, and batting away rumors that he was a Scientologist. So I looked forward to his return. Perhaps the time off would have left him energized, and ready for the next act of his career, in which he would retake the mantle as the most interesting global movie icon of our time. • Men In Black 3. • After Earth, a sci-fi drama about a father and son (Smiths Will and Jaden) investigating an alien planet, directed by M. Night Shyamalan. Seriously? This is what Will Smith has decided to do with his career? That is some real Nicolas Cage-esque laziness right there. I'm sure there'd be a I Am Legend 2 on there (spoiler!) had Smith's character not died. (UPDATE: Ha, turns out there IS one! Smith's movie stardom is now a matter of maintaining the brand, which is always when the brand begins to fade. His performance in Seven Pounds was sour and constipated, containing none of the joy Smith had brought even to his more intense work. 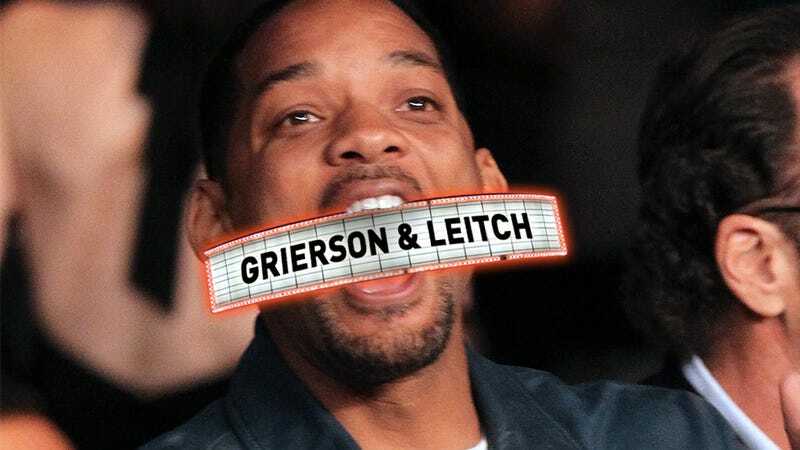 Men In Black 3 is a "character" Smith has played twice before and could do in his sleep; the same goes for the other upcoming sequels. The shame is that Smith had the perfect role for a comeback in his grasp, written precisely for him by one of our most respected filmmakers. Quentin Tarantino had conceived the title role of Django Unchained specifically for Smith ... but Smith, at this level of global fame, didn't have the fortitude to take the risk of playing a slave battling an evil plantation owner (played by Leonardo DiCaprio; imagine, DiCaprio vs. Smith, in a Tarantino movie!). So he turned down the role, which is now played by Jamie Foxx—a skilled actor, but one with a lower ceiling than Smith's. Smith could have hedged his bets by doing the Men In Black sequel AND Django, giving him his big tentpole hit while still showing he was still willing to hone his craft and stretch. But he chickened out: It might have been bad for that all-important Will Smith brand ... which is how you end up with Hancock 2 and I, Robot 2 and a stagnant career. Smith was once the most magnetic, likable actor in Hollywood. Then he just became the biggest. Now he's just another guy wanting our money, and not willing to work nearly as hard for it anymore.